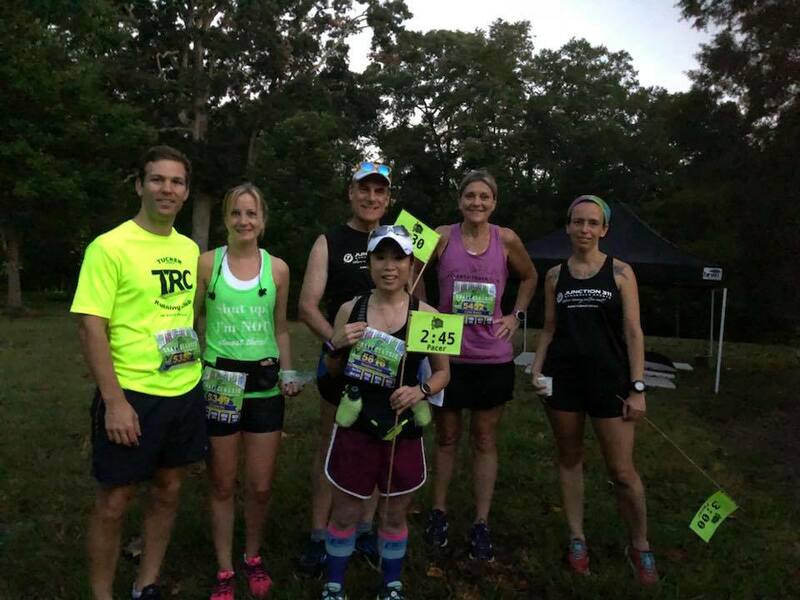 At the ATL 20K a couple of weeks ago, I was encouraged to volunteer as a pacer for the Craft Classic Half Marathon. I ran the race last year, and had considered repeating this year. However, the marathon training schedule for this weekend was originally a "drop-back" week, 8 - 10 miles. However, after I decided not to "race" the Big Peach Sizzler 10K on Labor Day, and discussed this with Coach Carl, he encouraged me to go ahead and pace as a medium long run. I volunteered for the 2:30 pace group. That was 30 minutes slower than my finishing time last year (nearly a new PR at that time), yet the pace would be fast enough to be a good training run and not so slow that I would get bored. I've been curious about pacing, and have seen it done well on several occasions. I owe my 10K PR from the 2017 Big Peach Sizzler to a great 50 minute pace group. And my half-marathon PR at the 2017 Jeff Galloway race was also aided by the 2:00 hour pace group: they helped me hold back for the first few miles, saving enough energy to run a negative split race and to a dramatic 3-minute improvement on my previous best. The night before, I printed out a pace chart at an 11:25 min / mile pace, which would get me to the finish line 20 seconds ahead of time. Last year the Craft Classic course felt a little long, but the start and end sections would be different this year. 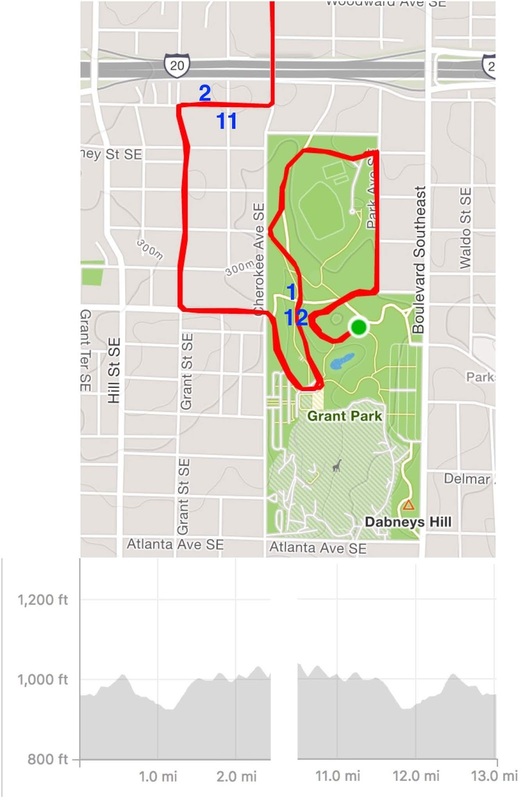 Anyway I figured that gave me enough flexibility to speed up a little if needed near the end, and would work out fine if the course was an accurate 13.1 mile distance. 80 deg F at the end of the race. When we arrived at Grant Park around 6 am, it was already warm and humid. As I didn't need any extra miles, I restricted my warmup to dynamic stretching. Sonia Watson, the other 2:30 pacer, and I found our places evenly staggered from the start line, with 1:45, 2:00, and 2:15 pacers in front of us. Sonia and I shared our plan with the runners around us, 2 minute run with 30 second walk intervals, and walking through the water stations. I encouraged everyone around us to hydrate at every water stop. After the National Anthem concluded at 7:30 am, the crowd began to move forward. We crossed the starting mat about 30 seconds after the gun start. Sonia and I settled into an easy jog, and when my watch sounded at 2 minutes in, I called "Walk break!" and raised my hand. 30 seconds later, "Let's go!" and we resumed running in a loop around the northern half of the park. At first we were running about a 12:00 min / mile pace, but gradually sped up to finish the first mile in 11:12. We were well into the second mile before we left the park, heading through the Summerhill neighborhood. 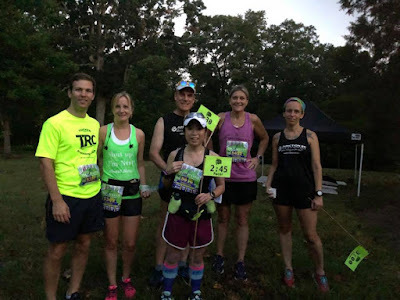 Some of the early water stops were crowded, and so I relied on the Nuun bottle that I was carrying for my own hydration, letting the other runners patronize the water stops. With pacer partner Sonia Watson. Photos taken shortly before sunrise. 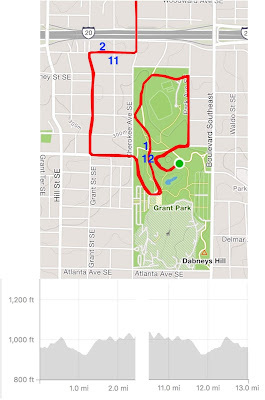 The benefit of running through the park for the first mile-plus shortened the amount of time we spent in the middle lane of busy Decatur Street, after which we headed into the Inman Park neighborhood. We were right on pace at mile 2, and about 10 seconds ahead of pace at mile 3 and 4. Somehow we slowed down a bit on the Freedom Parkway pathway, even though mile 5 was level or slightly downhill, falling behind by 20 seconds. I tried to push through mile 6 on the level part of Highland Avenue, but lost another 5 seconds. Mile 7, on Virginia Avenue, was the last downhill mile before reaching the Eastside Beltline. We shaved about 10 seconds off our time, being 15 seconds behind pace as we began running southbound on the Beltline. At this point, Sonia and I became separated, as I kept pushing to avoid losing any more time, even though we were running a gradual but steady uphill. I would turn around and call back with each walk break and run resumption, but it seemed that Sonia's group was falling a little further behind. Was I going too fast? At mile 8, crossing Ralph McGill Blvd, I was still 20 seconds behind. I suppose that I was exactly on pace if we eliminated the 20 second cushion that I had planned with the pace band. A few people were running with me, and I assured them that I was close to the pace, even with my run-walk intervals. Crossing Irwin Street at the 9 mile mark, I took a cup of Gatorade at the water station, and noted with satisfaction that I was now less than 5 seconds behind the desired pace. Approaching the southern terminus of the Beltline, the route up the ramp was not marked, but I called out with authority "Up the ramp!" I just hoped that I was right about that! I looked back onto the Beltline as I headed up to Edgewood Avenue, and didn't see Sonia at all. Fortunately I saw a sign at the top of the ramp directing us to turn right onto Edgewood. Whew!! The route was well-marked the rest of the way. 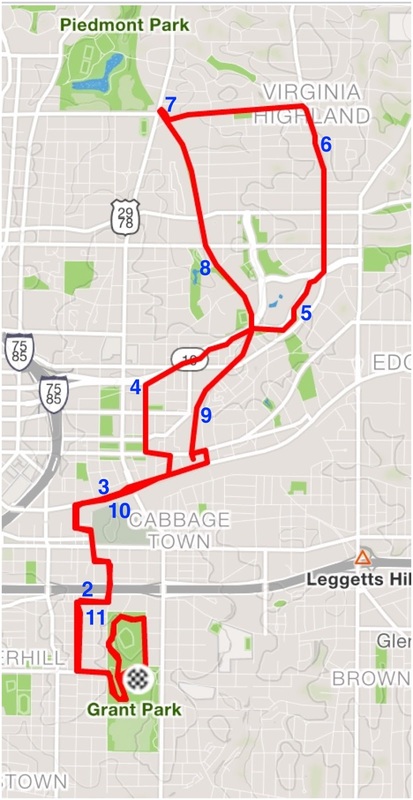 I didn't intend to speed up, but having sped up a bit to get on track with the plan on the Beltline, I was now running ahead of pace, reaching mile 10 nearly 25 seconds ahead of schedule. Hmm, how did that happen? I had been regularly informing the runners around me approximately how many seconds behind pace in the early miles, and now apologizing for being a little ahead of pace. I tried to encourage everyone, "If you finish with me, you'll definitely break 2:30; if you're behind me but can see me, you'll probably finish right around 2:30." The runners around me didn't complain, and a few were following my run-walk intervals. I tried to take it easy, but at mile 11, I was 40 seconds ahead. Even so, I was feeling the temperature, and just trying to stay strong and enthusiastic for the runners around me. I continued to hold my pace stick above my head with the number clearly visible from behind. Re-entering the park, I spotted the mile 12 marker, still 40 seconds ahead. What to do? Last year the route was long and it took me a full minute longer to finish based on my Garmin. The thirteenth mile was a big struggle. A substantial uphill section that forced me to take a walk break 30 seconds earlier than planned. I hated to give in, but I just couldn't push up the hill without the break. I was out of Nuun and was feeling parched. To my shock, the mile 13 sign came up after just over 9 minutes of running, even though my watch indicated I had slowed to a 11:45 min / mile pace for that section. At 2:25:50 at that point - how did I mess up this badly? I slowed down a bit more, and all of the runners with me pulled ahead as I had hoped they would. The music from the finish line drifted across the park, "Eye of the Tiger" by 80's group Survivor. Yep, that was fitting, but the thought that came to me, I think I even vocalized it, was "Long runs put the tiger in the cat!" I decided that the 13-mile marker was definitely misplaced, when I had to run nearly a quarter of a mile to get to the finish line. The clock was just past 2:29 when I crossed the timing mat, with my watch showing 2:28:25 for my finish, and 13.04 miles elapsed. As a volunteer wearing a Big Peach Sizzler shirt gave me my medal, I wondered, was my Garmin off, or was the course too short? I calculated that if I ran the same pace for 13.11 miles, I would have finished closer to 2:29:30, which would have been perfectly acceptable. I grabbed a cool bottle of water and guzzled most of it down within a couple of minutes, then took a second bottle, which I drank a little more slowly. A few runners came up to thank me, but unfortunately I was so tired I was having trouble making conversation. Sonia crossed a few minutes later, so I don't think that she finished in 2:30, but the heat and humidity was really tough. Finally I decided I had better sit down on the curb, as I was a little dizzy. I wasn't sure that I would be able to get up, but after Lindy Liu and her pacer partner crossed just a few seconds ahead of 2:45, I managed to get up without too much trouble. A few cups of Gatorade helped me regain some equilibrium. I certainly didn't expect that pacing would be that difficult! And I said to Lindy, who is also training for New York, "If it's hot like this in New York (in November), I won't be able to finish the marathon distance." Yet I did everything according to my plan: hydrated well yesterday, ate a decent breakfast this morning, and ran over a minute / mile slower than my eventual marathon goal pace. Whew, I have a long way to go with my training. I just hope that it begins to cool down before much longer.